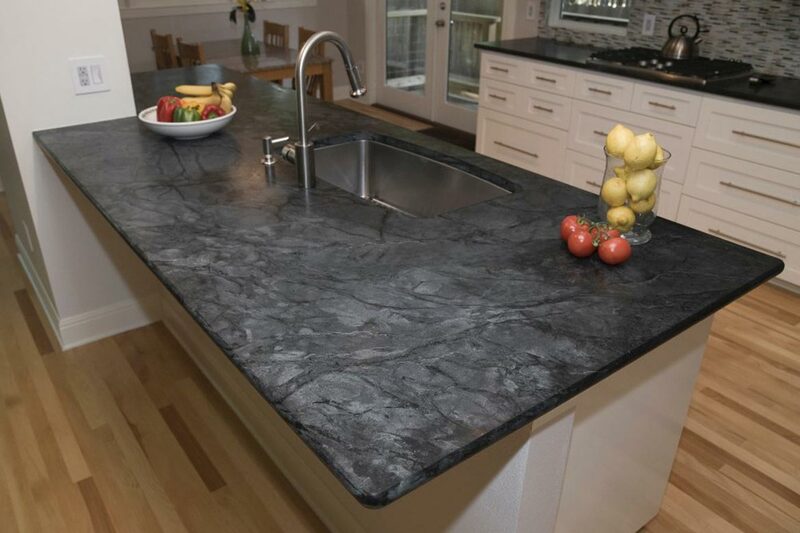 Soapstone, a darker natural stone of charcoal gray in various shades, is a beautiful and practical countertop material that is naturally stain resistant and easy to maintain. However, in certain circumstances, it may be necessary to have a professional stone restoration contractor repair chips or cracks, hone away nicks and scratches, or resurface your soapstone for a more even appearance or to restore it to its original color. Tennessee Stone Care provides complete soapstone services to resolve virtually any problem associated with soapstone. From countertops and table tops to bar top and vanity tops to shower walls, tub surrounds, and fireplace mantels, we service any type of soapstone, including exterior applications. The processes involved in the formation of soapstone change the stone without melting it. This is how soapstone gets its soft, smooth feel, almost like a bar of soap, hence its name. Soapstone used for art is softer, because it contains more talc and can actually be carved with a fingernail, but soapstone used for home décor and architecture is much harder, because it has lower talc content. Because soapstone can absorb, store and radiate heat, it is best utilized on countertops or tabletops and fireplaces or wood burning stoves. You can place hot pots or pans on soapstone without having to worry about scorching or burning the surface. Unlike granite, marble, or slate, alkalis and acids found in many foods and drinks are not likely to stain the dense and inert surface of soapstone. Soapstone does not need to be sealed because it is not a porous stone. Any staining that occurs can be quickly and easily remedied with scrubbing or sanding. The color of soapstone loses consistency with time and use. After installation, using mineral oils is optional, depending on what kind of long-term look you hope to achieve. The oil does not protect soapstone, but it does help give the soapstone a more even appearance. Some people prefer a naturally aged appearance in which more frequently used areas become darker than other areas. If a sealer or oil has already been applied, the original color of soapstone can be restored. For a free estimate on any of our soapstone restoration services throughout Tennessee, including Nashville, Memphis, Knoxville, Murfreesboro, Clarksville, and Chattanooga and surrounding areas, send us a message or give us a call at (615) 351-4676.